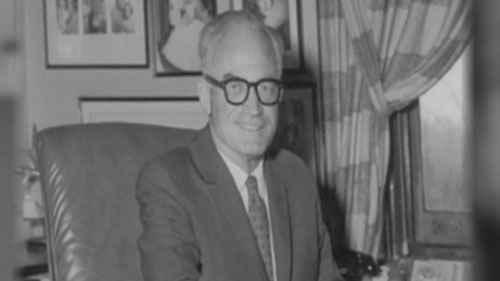 WASHINGTON – Arizona Sen. Barry Goldwater lost the 1964 presidential election in a landslide, but that didn’t stop veterans of his campaign from claiming victory all these years later. Goldwater’s devotees – now gone nearly as silver-haired as “Mr. Conservative” himself – gathered Tuesday in Washington to celebrate the candidate who they said lit the torch of a conservative movement that still burns today. 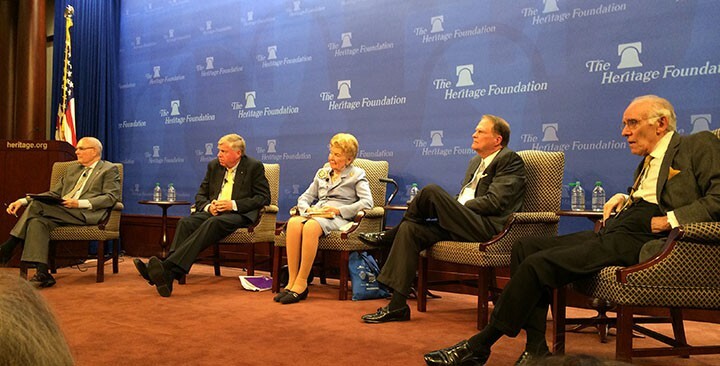 About 150 admirers attended the Heritage Foundation event to mark the 50th anniversary of a campaign that even the senator acknowledged was quixotic. The event quickly became a love fest and a “celebration of our victory in 1964,” said panelist and conservative writer Victor Gold, who was deputy press secretary for the Goldwater campaign. “I say victory because all you have to do is look at what has happened in the last 50 years to see we really didn’t lose,” Gold said. “His candidacy marked the beginning of a tectonic shift in American politics … from containment to liberation, from liberal to conservative, that continues to shape the nation,” said Lee Edwards, Heritage’s Distinguished Fellow in Conservative Thought. Goldwater, who died in 1998, was born in Arizona when it was still a territory. He was first elected to the U.S. Senate in 1952, but gave up the seat to run for president in 1964. He was beaten soundly, carrying just six states and racking up only 52 electoral votes against President Lyndon Johnson’s re-election bid. Goldwater returned to the Senate in 1969 and stayed until 1987 – long enough to see Ronald Reagan capture the White House. And for those at Tuesday’s event, it was Goldwater’s 1964 campaign that made Reagan’s presidency possible. As the Goldwater veterans reminisced Tuesday, most of their recollections were like Schlafly’s – conceding the battle, but claiming victory in the long war. And when they weren’t talking about the campaign, they were talking about the man himself. Gold recalled Goldwater’s magnetism, which he said derived from the senator’s directness and from his authenticity, qualities Gold said he finds in short supply among modern politicians. “They saw him as an honest man,” Cox said. One of those journalists was Neil Freeman, who was then Washington editor of the National Review. He pushed the conservative magazine’s founder, William F. Buckley Jr., to endorse Goldwater over GOP primary opponent, Nelson Rockefeller. “We knew that Barry would state our case – our new conservative case - with clarity and conviction,” Freeman said. “We didn’t know it then, but we know it now, that for the next 50 years, Goldwaterism would become the single-most powerful force in one of the nation’s two great political parties,” said Freeman. Cox, who served as the Washington chief of staff for Goldwater Jr., said Republicans serving in Congress today have much to learn from the senator’s example. But for those in the room Tuesday, Goldwater’s legacy is already secure. 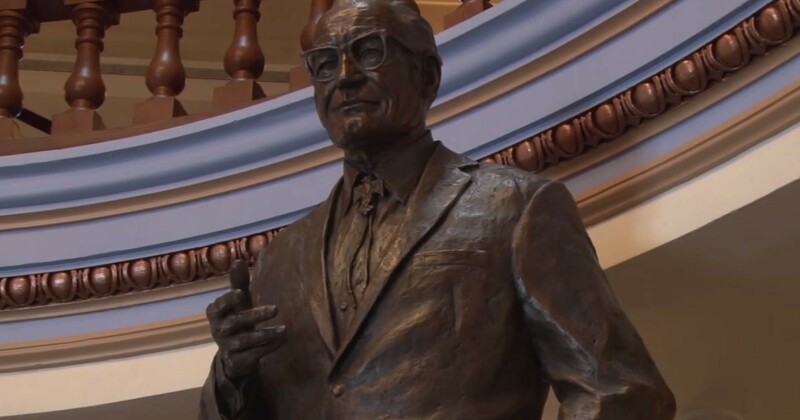 Although he lost to Lyndon Johnson in the 1964 presidential election, former Arizona senator Barry Goldwater left a conservative legacy still remembered by many. Reporter Stephen Hicks attended a talk to commemorate the late senator. 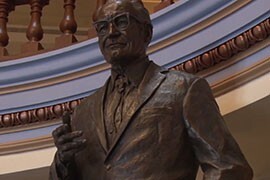 A statue of former Arizona senator and GOP presidential nominee Barry Goldwater in the State Capitol is waiting a move to the U.S. Capitol where it will be permanently displayed. 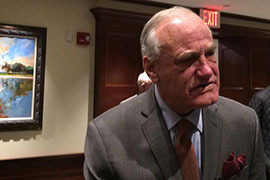 Devotees and former staff for Arizona Sen. Barry Goldwater gathered in Washington for the 50th anniversary of his failed 1964 presidential bid, which they say launched the modern conservative movement. 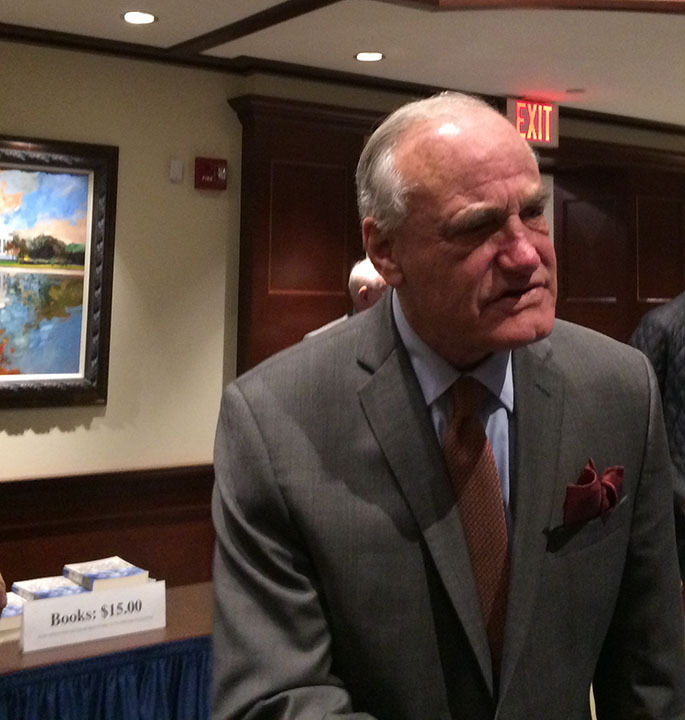 Barry Goldwater Jr. at an event for his late father, Arizona Sen. Barry Goldwater. He said his father's failed 1964 presidential bid "is to be celebrated" for launching the conservative movement.